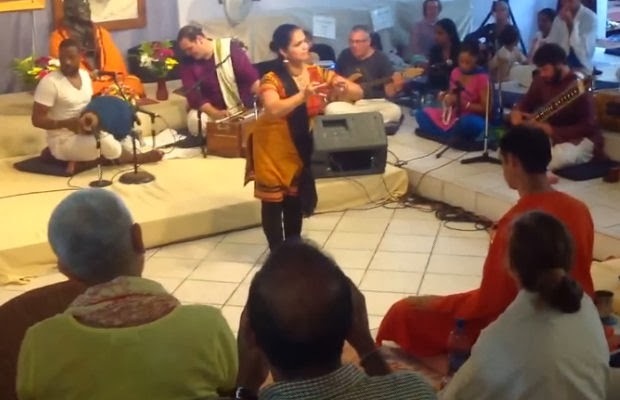 A Beautiful Bhajan, Poem and Dance Presented by Gaura-Vani ~ The Toronto Hare Krishna Temple! We stumbled upon this very nice video of Gaura-Vani and As Kindred Spirits leading a beautiful bhajan at the Sivanananda Ashram in the Bahamas from the spring of 2013. In the video, Gaura-Vani presents a delightfully beautiful rendition of the classic Vaisnava Song, "Udilo Aruna Purave Bhage". Mixing the traditional singing of the bhajan (along with a unique chorus) with a poetic translation and combined with a dance performance depicting the soul-stirring lyrics, this video is one that shouldn't be missed!